Loving the Dough Boy Smoothie so much!!! I love that it’s not cold – so the fact that it’s a chilly spring morning doesn’t mean I can’t have a smoothie. I love that it’s thick and doughy and that the only thing I have to clean is the vita-mix, which gets a good rinse and a quick scrub and it’s all done. Today I added strawberries to give it a touch of pink! Loving the Dough Boy Smoothie so much!!! I love that it’s not cold – so the fact that it’s a chilly spring morning doesn’t mean I can’t have a smoothie. I love that it’s thick and doughy and that the only thing I have to clean is the vita-mix, which gets a good rinse and a quick scrub and it’s all done. 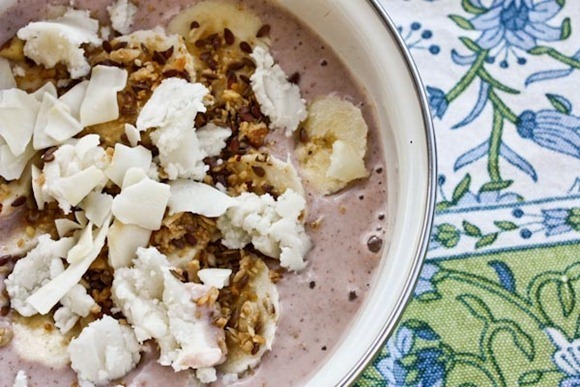 All the doughiness of overnight oats in a delicious smoothie form. COCONUT BUTTER!! It’s no longer rock solid at room temp now that spring is here! Set in fridge overnight in blender. In the morning, add more milk and blend. OpenSky is helping me giveaway a Vita-mix!! I was very lucky to get one as a product to review last year, and from the bottom of my heart I gave it glowing reviews. I didn’t realize what all the hype was about until I started to PLAY with it. Man is this thing powerful and versatile. Win one of your own by following me on OpenSky [per usual, if you’re already following, you’re already entered!] Winner announced on Friday! I had my smoothie with some Gypsy Coconut Chia Chai tea that I got for Xmas! Last night I went to bed feeling really anxious. A lot of important emails came in my inbox (including our taxes from our new accountant! Ahhh!) and I went to bed with a massive to-do list for this morning. I’m slowing chipping away and hope I’ll be able to get back to regular scheduling by the afternoon since for once my calendar is wide open today. Breathe. Breathe. Ahhhh Dean & Deluca 🙂 Your mug just made me miss Charlotte really bad! I don’t think I can handle another day without trying those coconut chips! I want the dough boy smoothie too, but the hubs shattered my mixer and well a Vita-Mix is in my very distant future! Awesome give away! I already follow you on OpenSky and am crossing my fingers! I’m in the same boat with the to do list anxiety. Good luck today – it will all get done (that’s what I keep telling myself)! Awesome. Who wouldn’t love a Vita-Mix? I eye ’em every time I am in Costo (where they are a *little* bit cheaper), but haven’t been willing to shell out the moolah for one yet. Holy cow – I would love to win a VitaMix!I’m already following you, so for now I’ll keep my fingers crossed. I tried a version of your dough boy smoothie yesterday for breakfast and it tasted so good! The texture was so creamy! The coconut flakes on top seal the deal for me. Looks wonderful! Meeting with the accountant sounds like a blast. Have a good day! My coconut oil is always solid at room temperature, even in the summer with the A/C off. I guess my house is just cold. Good luck getting through your to-do list today! I looooooooove today’s placemat. I love those colors! That looks sooo delicious. 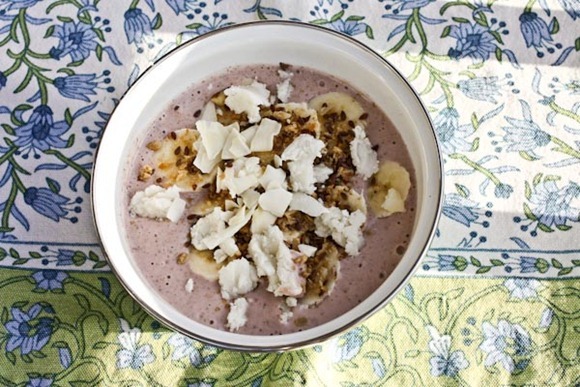 Also, coveting that bowl – so pretty with the pink smoothie. Amazing giveaway Kath!!! I already follow you on OpenSky but am not sure if Canadian residents are eligible – I think they only ship to the US. Nevertheless, your breakfast looks gorgeous as always! Anything doughy is a WINNER in my book! I feel that anxiety. Yesterday I woke up to a broken furnace, a funeral service that I need to find an organist for (I’m a minister), no internet in my office, a missing tax form and a blog glitch. Ommmmmmm. I love the touch of pink in the smoothie:) I’m a berries girl! Chai tea is one of my favourite teas. I have not tried any Gypsy coconut chai tea though (Actually, I didn’t know there is such a thing). Why is it that I never get such interesting gifts for xmas? Strawberries and banana is my fave combo! 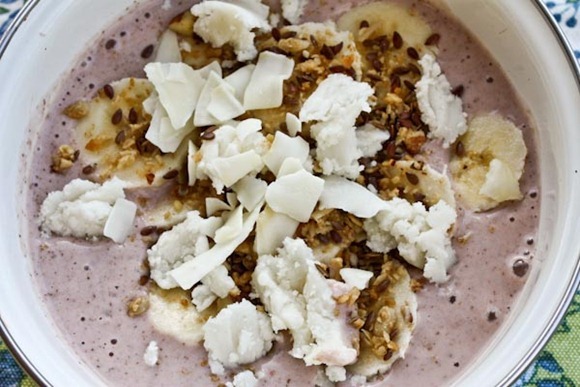 Yogurt is always my go-to smoothie thickener. Will defo try soaking the milk + chia seeds overnight instead for a change..
Ack! Something isn’t working for me on their sign-up page…will try again later today. (It just keeps re-loading the same page when I try to put my info in and press “sign up”). Who knows, it’s probably somehow my fault! The same thing happens to me. 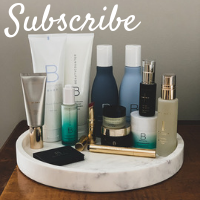 Not working and I don’t get a newsletter (cause I did subscribe before). What an amazing give-away Kath! The smoothie looks so good. Ick! Taxes! Good luck on getting it all done. looks yummy! Do you the satiety of the doughboy smoothie is the same as hot oatmeal? This would be great for summer! oops left out *think* but thanks! I’ll definitely try it out! I’m with you on the anxiety…I need to breathe too. Taxes, stress, money you name it, it’s causing me stress. I hope you have a great day Kath. I bet banana chips would taste good in that smoothie too! AHHH! I am so making that for breakfast tomorrow!!! =D Did a SIAB this morning at around 7 AM, but feeling hungry already – this looks like it’ll be a good fix for that! I hate going to bed with to much on my mind! I struggled with it last night too! Smoothie looks great! Also where did the pictures on your kitchen wall come from?? Oh goody goody! A VITAMIX…crossing fingers, eyes, toes, arms & legs! I’m definitely going to try the breakfast smoothie recipe. 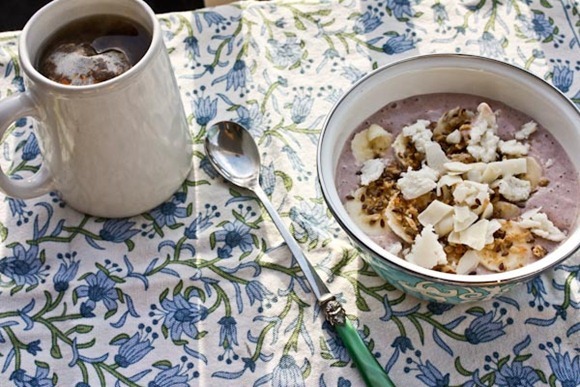 I love overnight oats so I know I’d love this too! Thanks for the great giveaway! I entered and am excited to see who wins! I would love me some of that Dough Boy Smoothie.. looks delicous.. and the ingredients are staples! EASY! It isn’t warm enough for a smoothie here yet…soon I hope! I would love a Vita-Mix – they sound amazing! Hope you can work your way through the to do list, I am still very impressed at how you and Matt are handling all of this! Maybe if you have any downtime you should start planning a vacation for late in the year to celebrate everything! I really wanted to make one of these for this morning, but I never set it up last night. Now I’m jealous. I’m obsessed with my vita-mix! That thing is so awesome. What a great giveaway! What an exciting giveaway! They really are hookin’ your readers up!! OH MOY GOODNESS!!?!?! Giving away a Vita-Mix! That is like a dream come true!!!!! Gah, I would be the happiest girl in the world if I won… good thing I am already following you on OpenSky! Also, did those chalkboard wine glasses ever make their debut with OpenSky? These smoothies are great Kath – and I love all the different variations you come up with! I looove making smoothies, even if it seems like such a process. sending deep breaths your way! Yay giveaway! I hear so much about the vitamix but I don’t think I could ever shell out that much money for a blender. No matter how amazing. I need to try one of these dough boy smoothies. I recently bought a bag of unsweetened coconut (inspired by you!). I have slowly started to add it to EVERYTHING. Good luck with your to do list! You’ll feel better once you start crossing things off. I LOVE that Gypsy tea. I have a Pumpkin Spice one that is SO yummy! 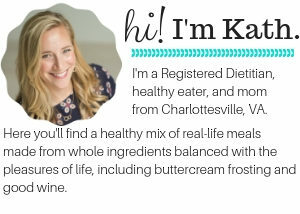 And I recently got that exact same VitaMix – you are so right, you don’t realize what you’ve been missing out on until you start playing around with it! I tried out a version of your dough boy this morning for the first time, and fell in love. I can see a definite streak of smoothies in my near future. I also love how they aren’t cold, and its just like thinned out cookie dough for breakfast! Thanks for the inspiration per usual kath 🙂 good luck with your day! Ooh, a Vita-mix would be awesome. My mom just got one, and I’m SO jealous. I blend everything in the food processor. I did break out the blender a couple times recently, but it makes a weird smell when I use it. Not sure if that’s normal or just from non use. Okay…I need to make this smoothie! Not sure what the hold up is…I know I would love it. Tomorrow! 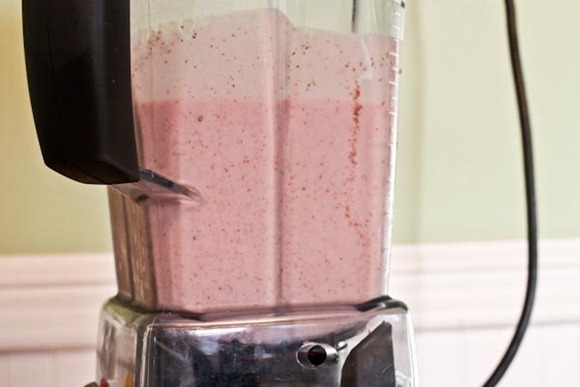 I often make something similar using an immersion blender since I don’t have a VitaMix.When I use the immersion blender it still comes out a bit…um, chunky? Does the Vita eliminate that? Good luck getting everything done this morning!!! Where can I find the art work posted behind your vit-mix??? I love it! I went to Opensky and tried to find your “store,” but the only thing I see is the carafe & glass. Is your store still there? OMG! A vita-mix??? Have been coveting one for years. Just haven’t brought myself to do it yet. Fingers, toes, legs, crossed! i’m pretty sure i already follow you on opensky, but when i clicked to log in to make sure, it doesn’t allow you to? or sign up? I love Chai tea but Coconut Chai sounds even better! I’m already following you on OpenSky, yay! I reallyyyyy want a Vitamix! 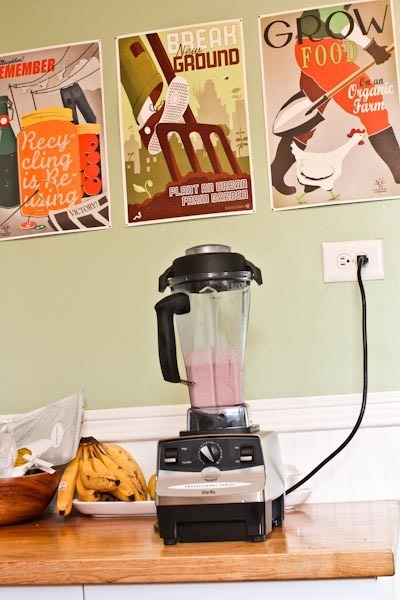 I’ve been making smoothies in my food processor, which sometimes doesn’t go so well. Fingers crossed! Thanks for the opportunity! So generous of you and Open Sky to repeat this sweet giveaway, Kath! A Vita-mix is pretty special, indeed! I know that overwhelmed feeling. It will pass and I hope it does quicky. A Vitamix giveaway is epic!!!! Wow, Vita Mix give away… best give away ever! This dough boy would sure be one of the first things I would do if I won. Hope your day is a breeze! Other than being delicious, I think what’s makes this even more delicious is the color!!! How pretty. A perfect start to the day. Next to blueberries, strawberries are my favorite fruit. That smoothie looks so good! Beautiful, sunny weather today! It is just a tad bit chilly, but I do not mind. OK I definitely just “followed” you on open sky…what an awesome giveaway! 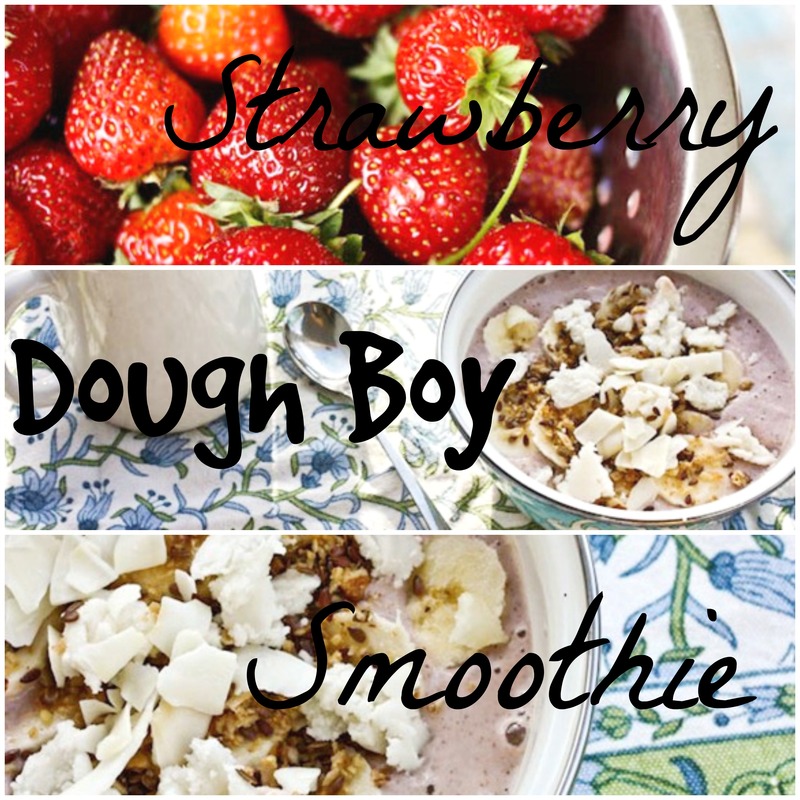 I almost almost tried a doughboy smoothie yesterday – perhaps tomorrow I will! I’m definitely intrigued! Waking up to a dough boy smoothie sounds like the perfect way to release some of that anxiety from last night. Hope things play out well today for you and that you get what you need to accomplished! Made my first batch of coconut butter this weekend in my vitamixer, and I am so happy to hear that it softens up when it warms up. We are still cold here in Idaho:(. The blue bowl is back! I’ve been looking for these… where can I find them? I hope your to do list goes easily for you! wow i really want a vita mix. my blender was my grandma’s probably from 50 years ago. I’m looking forward to waking up Saturday morning to make this! oooh I really love those art prints! Let us know when they are available again! Coconut chai tea is amazing! Celestial Seasonings has that flavour too and I love it! That coconut butter looks amazing!! I have a jar of it, I need to eat it more often. SO YUMMY! Ooo what a fabulous giveaway! I follow you on opensky! Oh My Gosh!! I Made one of your dough boy smoothies this morning and added strawberries too!!! How Funny!?!?! But now I’m following you on OpenSky! Yay! Oh my, those coconut chips win out over my measly desiccated coconut anyday! Vita-mix is filled and in the fridge!! I’ve recently started making green smoothies. I love them but my family can not stand the texture they have made with my old Osterizer. I really want a Vitamix to make a nice smooth texture so I can get my family consuming more veggies. 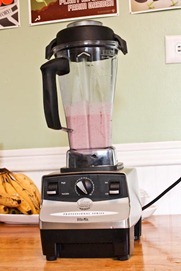 When I first heard about the Vitamix I thought there was no way I would pay that much for blender. Now I’m saving pennies for one. I hope I can win one and get it much faster that way. Just joined OpenSky to follow you. Looking forward to seeing how this works! 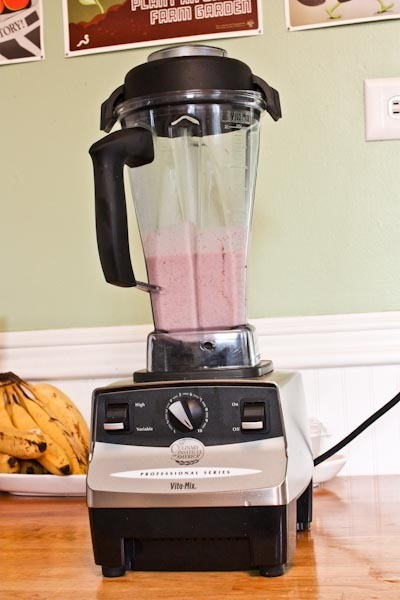 I give my food processor quite a workout, so a Vitamix would be a real treat. 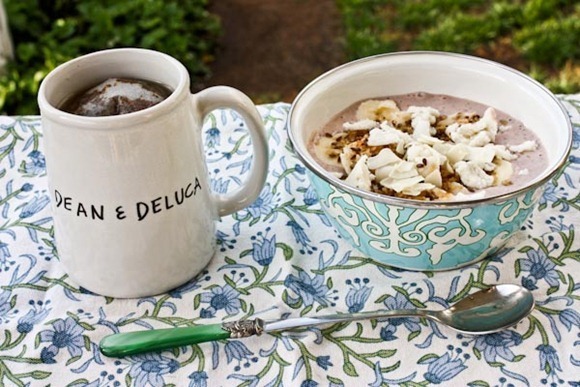 PS – Coconut Chai tea sounds great…especially alongside a ripe banana. Drooling over your over night smoothie!!! Trying that tonight/tomorrow. I follow you on Open Sky already!